To ignite a global conversation and transform stereotypes, The Raw Beauty Project NYC has partnered with the Christopher & Dana Reeve Foundation to showcase an exhibit of photographs featuring twenty women living with various types of disabilities. Proving there is no singular definition of beauty, the photographs will be unveiled at ACA Galleries on September 20, 2014, with proceeds from the event benefiting the Reeve Foundation. Often, women living with disabilities are depicted as victims or defined by their injury or condition. The Raw Beauty Project NYC aims to redefine beauty by challenging stereotypes, celebrating courageous stories and breaking down barriers for the millions of women living with physical and sensory challenges. The twenty women—whose disabilities range from spinal cord injury, multiple sclerosis, spina bifida, to cerebral palsy—posed for renowned photographers for the upcoming exhibit. One of the models, Wendy Crawford, was part of the original Raw Beauty Miami exhibit in 2006. When Crawford, a former fashion model, was 19-years-old, she was in a car accident that resulted in a spinal cord injury. Since her injury, Crawford has been outspoken on the need to evolve the definition of beauty, which has become limiting and unattainable for women living with disabilities. Beyond Crawford, models include well-known disability advocates such as Angela Rockwood and Danielle Sheypuk. To capture the photographs, The Raw Beauty Project enlisted photographers whose resumes include Vanity Fair, Allure, Sports Illustrated, Glamour, GQ, Nylon Magazine, as well as work with Mercedes, Tommy Hilfiger, Club Monaco, Target, Old Navy and Tresemme. Interestingly enough, one of the photographers, Walter Chin, photographed Wendy Crawford as a young model prior to the accident. To drum up excitement for the campaign and photography exhibit, The Raw Beauty Project NYC also launched a 30-day social media challenge asking supporters to post photos of people who embody the spirit of Raw Beauty and tag #RawBeautyNYC to help fuel the cause. For additional event details and information, visit www.rawbeautynyc.com. “Raw Beauty NYC” is an innovative visual arts project designed to inspire the public to create new perceptions, transform stereotypes and breakthrough personal obstacles by expanding awareness of women with physical challenges. This photography exhibit is a collaboration between photographers and twenty women living with various types of disabilities that showcases their beauty, empowerment and sensuality. The audience glimpses into the lives of these incredible women through photography and biography. Raw Beauty Project NYC Social Media Campaign - Your Chance to Participate! Enter 30 Days of Raw Beauty! For 30 days (ends Sept.20, 2014), we are challenging everyone (both men and women) to take to social media and rally support for Raw Beauty. The Raw Beauty Project was born with a purposeful mission - to inspire the public to create new perceptions, transform stereotypes and breakthrough personal obstacles by expanding awareness of women with physical challenges. Please share this message with your family members, friends, influencers and colleagues so they too can join us and post their photos -- the more photos posted, the louder our collective voice is to break down barriers. Watch a preview of the Raw Beauty Project NYC and get a sneak peek of a few off the Raw Beauty models at work. Attend, be a sponsor or give a donation for the groundbreaking photography exhibit that showcases the true beauty and sensuality of women living with disabilities with photos by high-profile photographers on September 20, 2014, at ACA Galleries in New York City. To learn more, visit www.rawbeautynyc.com . No donation is too small! Post your photo now. We will be keeping an eye out for #RawBeautyNYC tagged photos to share on our social media! Take the Raw Beauty challenge and prove there is no singular definition of beauty, and we are all beautiful no matter the circumstance or story. Together, let’s ignite a global conversation, embrace the raw beauty that exists in each one of us and celebrate life! 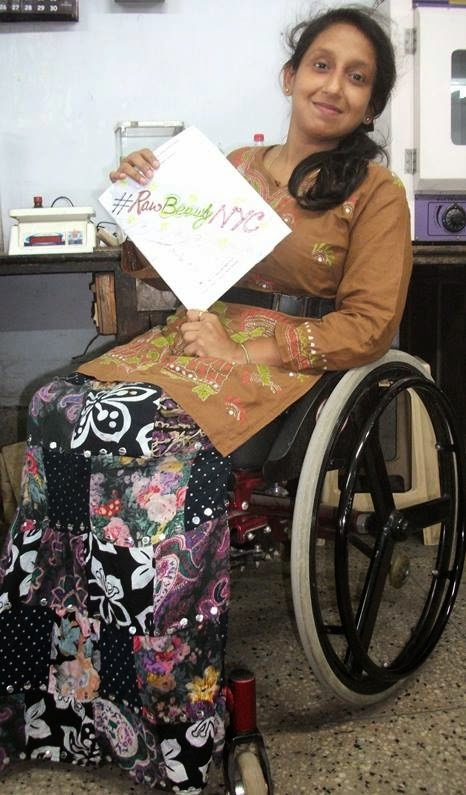 What an amazing concept in bringing to light the truth that women with disabilities are strong and beautiful too! Thanks so much for this! Will definitely share. It is possible to ably lessen any replica rolex uk lots of the reduced conclusion counterfeits which is also by just considering the particular observe having an vision in which desires to find out top quality. Rolexes, regarding examplePsychology Posts, are manufactured very properly , nor have got poor switch stamping or perhaps glued-on elements. Swatch's original hublot replica variety of timepieces, introduced inside Zurich, Swiss, released an exceptionally striking hair styling. The particular wrist watch aspects have been less difficult and also necessary much less elements, any layout which usually developed the particular timepieces equally better to work with plus more successful to be able to make. It was this kind of newest swiss replica rolex layout in which aided set Swiss again along with this kind of wrist watch market place. Swatch furthermore obtained reputation inside hip-hop local community. Inside advertising for the local community, Swatch produced timepieces together with interchangeable confronts and also groups. Swatch masters rolex replica can swiftly modify their particular timepieces seem, shade, and also total trend assertion simply by transforming the particular protect and also hanging that to a new plastic group. Day-glow, neon shades, and also bright groups have been every one of the craze. Omega timepieces being a manufacturer needs simply no benefits therefore. Folks rolex replica have become significantly alert to the particular lifestyle with this identify inside the kingdom regarding artist spectacular timepieces.